Josh Kilmer-Purcell and Brent Ridge are taking on a whole new lifestyle. Today Brent spoke with RealityWanted about their new hit show on Planet Green, The Fabulous Beekman Boys. Trading in their Blackberry for actual black berries is just one huge change in their new organic lifestyle. 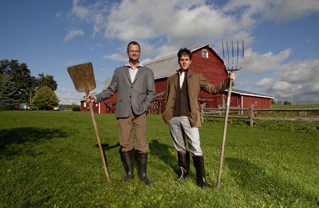 The Fabulous Beekman Boys premieres Wednesday, June 16th at 9pm ET on Planet Green.